Today I visited my 200th Starbucks for this blog. 100 Starbucks ago, I was sitting at Grand Central Terminal, half-way through my endeavor and somewhat optimistic that I could accomplish the task at hand. 100 Starbucks before that, I sat down at my first Starbucks on 52nd & 8th Ave and — quite frankly — had no idea what I was getting myself into. But here I am. 200 Starbucks into the blog and less than 10 away from visiting all the Starbucks in Manhattan. I’ll drink to that. 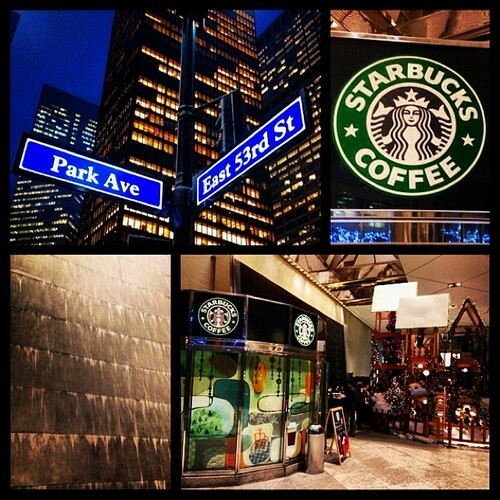 The Starbucks on 53rd & Park Ave is actually located inside a privately owned public seating area called Park Avenue Plaza. It’s just west of Park, and there are entrances both on 52nd and 53rd. The Starbucks is not a distinct store, but a kiosk style Starbucks located in the northeast corner of the space. There are office buildings above and other features include a book store, public restrooms, a children’s winter play place and a waterfall wall (pictured above). Unfortunately, this Starbucks does not offer WiFi, so if you’re coming here to get out of the cold, bring a book not a laptop. Also come early. Although the space is available 7-days a week until 10pm, the Starbucks is only open until 6:30pm on weekdays, which only makes sense. After all, it’s not like there isn’t another Starbucks just a few yards west on 53rd street.